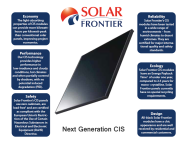 World's largest provider of CIS solar panels - Solar Frontier K.K. Home » Energy Products » Solar Energy Products » World’s largest provider of CIS solar panels – Solar Frontier K.K. Company Name: Solar Frontier K.K. Solar Frontier K.K., a 100% subsidiary of Showa Shell Sekiyu K.K. (“Solar Frontier”), has a mission to create the most economical, ecological solar energy solutions on Earth. 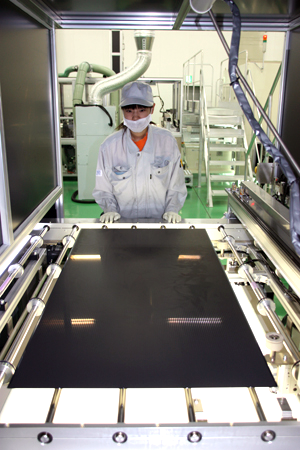 Building on a legacy of work in solar energy since the 1970s, Solar Frontier today develops and manufactures CIS (denoting copper, indium, selenium) thin-film solar modules for customers in all sectors around the world. Solar Frontier’s gigawatt-scale production facilities in Miyazaki, Japan, integrate compelling economical and ecological advantages into every module: from lower energy requirements in manufacturing to the higher overall output (kWh) of CIS in real operating conditions. Solar Frontier is headquartered in Tokyo, with offices in Europe, the U.S.A., and the Middle East. About Showa Shell Sekiyu K.K. Showa Shell Sekiyu K.K. is listed on the Tokyo Stock Exchange and has roots dating back more than 100 years in the downstream energy business, including research in solar energy that began in 1978. Commercial production of crystalline silicone modules began in 1983, and research on CIS technology began in 1993. Solar Frontier’s SF150–170-S module series offers among the highest conversion efficiencies of any mass-produced thin-film module – from 12.2% to 13.8%. Initial exposure to light can increase the power output further due to the “light soaking” effect of CIS modules. Together with high temperature tolerance and excellent low-light absorption, Solar Frontier’s CIS leads to a faster investment payback time and overall return on investment. In contrast, standard crystalline panels often produce lower output than specified due to real world conditions. All Solar Frontier modules are RoHS compliant and cadmium- and lead-free. Fewer production steps and raw materials also mean less energy was required to manufacture the module than crystalline modules of comparable output. SF150–170-S modules are shipped in virtually cardboard-free packaging and use recyclable corner pieces.